Cy0 is a new method in Real-time PCR analysis that does not require the assumption of equal efficiency between unknowns and standard curve. Cy0 is still the first method in Real-time PCR analysis that does not require the assumption of equal efficiency between unknowns and standard curve. As shown, the Cy0 method and the Gold Standard Ct (and others) were equally precise and accurate in optimal amplification conditions, while, when PCR efficiency was decreases, diluting amplification mix quantity or adding a biological inhibitor such as IgG, the Cy0 method gave significantly more accurate and precise quantification. Evaluation of qPCR curve analysis methods for reliable biomarker discovery: Bias, resolution, precision, and implications (FREE for Cy0method.org subscribers only under kind permission of Elsevier Limited - license #3036951067977) (p.s. Thanks to dr Jan M. Ruijter for involving our project in his evaluation of qPCR curve analysis methods). Moreover, the analysis of the data collected through this site, has given us the cue to find a path leading to a quantification method able to provide a valid result almost in every (suboptimal) amplification condition. In this sense, every global model we dealed with, has shown fitting problems in particular shaped amplification curves, i.e. when the flex point is too close to the X-axis, or as well, dealing with Taqman chemistry curves, either Sybr Green. At last, we would like to take this opportunity, to thank the hundred and more subscribers that with their interest have allowed our project to achieve this new result. That indicates a clear advantage of Cy0 over the linear regression method by JM Ruijter. "I have been evaluating the Cy0 in a qPCR assay to determine copy number variation in genomic DNA, using TAQMAN (FAM/VIC) chemistry. I estimated the Cy0, using the R qpcR library, from a 5 parameter log-logistic model fitted to the deltaRn values (automatic baseline, ABI 7300). In over 450 samples, I haven\'t identified any apparent sample quality problems, but have observed occasional, sporadic FAM automatic baselining problems. Importantly, the Cy0 method is relatively insenstive (but not completely invariant) to these baselining issues in terms of CN assignment, whereas the recommended Ct (0.2 threshold) gives rubbish results. In all other samples, the Ct and Cy0 have given identical, discrete, high confidence CN calls." thanks for the chance to use your method for PCR-quantification. I came across your method, when looking for other ways f or QPCR than using Linreg, realtime PCR-miner, DART and other programs, which claim to give efficiency values for correction. Now, in my hands all these methods give widely differing results and all have much greater variance for replicates than the good old delta Ct-method. Now, even though I do not understand all the maths in your procedure, it performs at least as well (or even better) as the delta Ct-method..." Thanks agains, and I will continue to submit data. I noticed thar Cy0 method were more precise than the Ct method, a 5 % difference in some results (i.e: RSD (%) of 8,8 to Cy0 against 14,4 to Ct). But this was only true to sample with sufficient DNA sample. I had some assays with low DNA samples that Ct got better results. I figure it was the lack of Data to estimate Fmax, that distort the Cy0 values. My experiments were design with a Full factorial Design (2^3), and I noticed that i had a greater resolution using Cy0 results. I work with a system to extract Adenovirus, and used PCRq to analyse my results. Thank you for your help. I hope this info were of any help. “Thanks for the quick results. I would like to have to following comments on the results. 1. By using the Cy values for plotting the standard curve, the R square values are generally increased (e.g. 0.9985->0.9995, 0.9972->0.9975, 0.9931->0.9996, 0.9995->0.9996 and 0.9978->0.9995; Ct value from ABI SDS 2.4-> Cy). Shatin, N.T. - Hong Kong S.A.R. Cy0 is a new method in Real-time PCR analysis that does not require the assumption of equal efficiency between unknowns and standard curve. Our method demonstrates that, in optimal amplification conditions, The Ct, second derivative (Cp), sigmoidal curve fitting method (SCF) and Cy0 methods methods are equally precise and accurate. However, when PCR efficiency was decreased, diluting amplification mix quantity or adding a biological inhibitor such as IgG, the SCF, Ct and Cp methods were markedly impaired while the Cy0 method gave significantly more accurate and precise quantification ( See example chart). 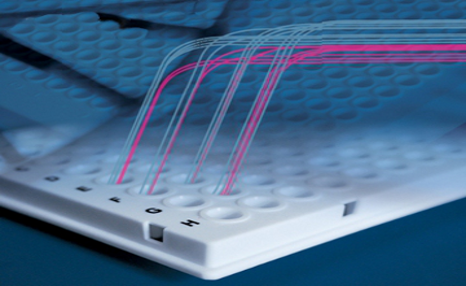 Background:Real-time PCR analysis is a sensitive DNA quantification technique that has recently gained considerable attention in biotechnology, microbiology and molecular diagnostics. Although, the cycle-threshold (Ct) method is the present "gold standard", it is far from being a standard assay. Uniform reaction efficiency among samples is the most important assumption of this method. Nevertheless, some authors have reported that it may not be correct and a slight PCR efficiency decrease of about 4% could result in an error of up to 400% using the Ct method. This reaction efficiency decrease may be caused by inhibiting agents used during nucleic acid extraction or copurified from the biological sample. We propose a new method (Cy0) that does not require the assumption of equal reaction efficiency between unknowns and standard curve. Results: The Cy0 method is based on the fit of Richards' equation to real-time PCR data by nonlinear regression in order to obtain the best fit estimators of reaction parameters. Subsequently, these parameters were used to calculate the Cy0 value that minimizes the dependence of its value on PCR kinetic. 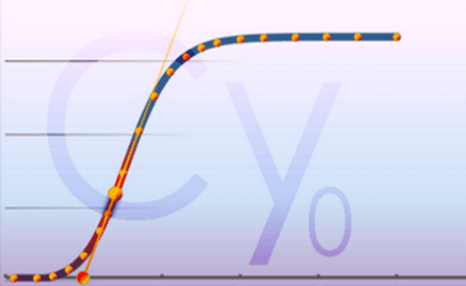 The Ct, second derivative (Cp), sigmoidal curve fitting method (SCF) and Cy0 methods were compared using two criteria: precision and accuracy. Our results demonstrated that, in optimal amplification conditions, these four methods are equally precise and accurate. 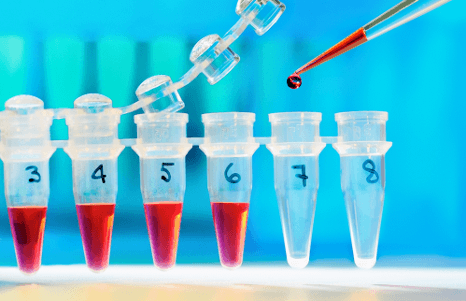 However, when PCR efficiency was slightly decreased, diluting amplification mix quantity or adding a biological inhibitor such as IgG, the SCF, Ct and Cp methods were markedly impaired while the Cy0 method gave significantly more accurate and precise results. Conclusion: Our results demonstrate that Cy0 represents a significant improvement over the standard methods for obtaining a reliable and precise nucleic acid quantification even in sub-optimal amplification conditions overcoming the underestimation caused by the presence of some PCR. Hello, You are the 1 visitor, Thanks.